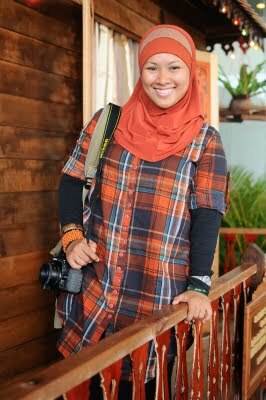 Lady in Orange : CyanaMoose look so gorgeous in this orange color blouse. She bought it from me when I was transit in KL from Bangkok to KCH. This blouse is among other items that I put on sale during my quick visit to the HQ office. She is my fellow colleague that works in Admin Department, HQ with the same company we work for. Do read her blog about her recent trip @ Borneo Escapade . She also into wedding photography team up with her husband.. so do check it out @ 1stverse Prod Sdn Bhd .